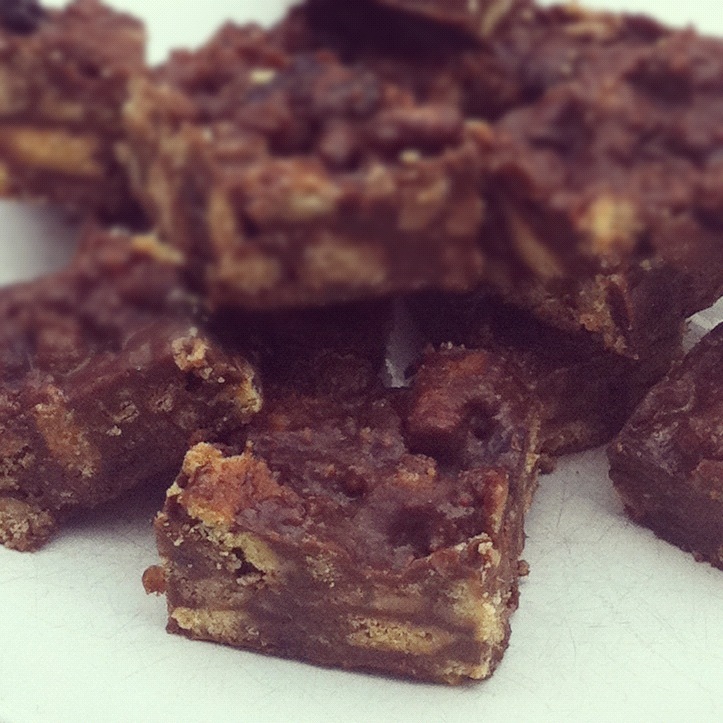 Not quite a Rocky Road, this is still a delicious, quick to make treat with a twist just for the grown-ups. Line a high sided baking tray measuring approximately 30cm x 40cm with clingfilm ensuring it hangs up and over the sides. Grease thoroughly with butter. Break up the biscuits into small pieces. You could wrap them in a tea towel and bash them with a rolling pin to speed the process up. Break the chocolate up into pieces and melt in an empty bowl placed over a pan of boiling water (a double boiler or bain marie). Add the butter to melt with it and stir frequently. Place the biscuit pieces, the raisins and cherries in a very large mixing bowl and mix together well. When the chocolate and butter have melted, add the golden syrup and stir in well. Just before removing from the heat, add the whisky to the melted chocolate mixture and stir in. Remove the chocolate mixture from the heat and stir into your biscuits, raisins and cherries. Mix thoroughly. You can use a potato masher at this point to break down any larger biscuit pieces a little more. Turn into the greased baking tray and level the mixture out evenly. Pop in the fridge for a couple of hours to cool. Once cooled cut into squares and serve. You can keep these refrigerated for a few days – if they can last that long, that is!